PreCentral’s Palm design competition has generated some pretty appealing Palm concept phones, like the model below. 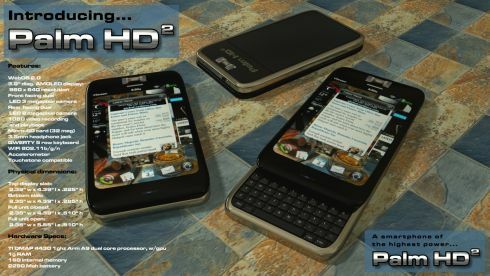 Dubbed the Palm HD2 and created by LCGuy, this is just another attempt at creating the future Palm Pre, since the Pre 2 was considered a disappointment by some. Palm HD2 runs WebOS 2.0 and features a 3.8 inch AMOLED display with a 960 x 640 pixel resolution, plus an 8MP camera at the back with LED flash and a 3MP camera upfront. 1080p video recording is on the list as well, plus a microSD card slot (32GB), a 5 row QWERTY keyboard and WiFi 802.11 b/g/n. The handset relies on a TI OMAP 4430 1GHz CPU (ARM A9 dual core), 1GB RAM, 16GB of internal memory and a 2250 mAh battery. There’s also an accelerometer on board and we know that the device is Touchstone-compatible. What do you say?